the fash pack: what is iGoogle? 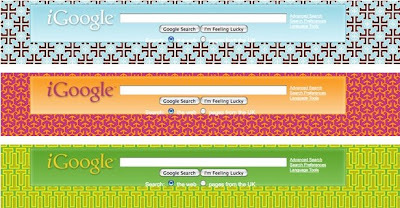 (NEW YORK) Google has teamed up with 70 artists to create a series of themes for its spin-off iGoogle, which allows users to create personalized homepages. Oscar de la Renta, Tory Burch, Diane von Furstenberg, Dolce & Gabbana, Mark Ecko, and Nigo are among the fashion brands that have contributed to the project, joining other notables like Coldplay, Michael Graves, and Jeff Koons. De la Renta used a signature poppy flower motif and Burch her trademark emblem, while Dolce & Gabbana features their trademark Animalier print. It's been revamped for the web with gold reflexes, lighting, and shading. During the day, the reflexes and texture will move from left to right recalling the sunrise and sunset. to personalize yours, go here. Ooooh, loved them! Had difficulty picking the best, they're all fab! Thanks for the tip!